Diamond Select Toys has sent along info on this weeks new releases. Fans looking to spruce up their Halloween shelves are in for a treat. Here’s what to look for thsi week. The classic Rankin/Bass holiday film is back from the grave! 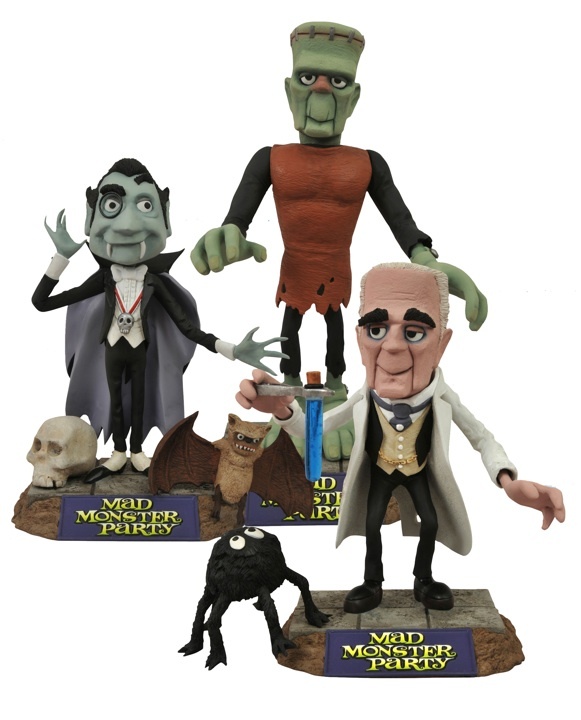 Featuring the iconic stop-motion animation of Rankin/Bass and starring every famous monster you can think of, Mad Monster Party roared into theaters in 1967 and has been a cult classic ever since. Now, the film gets the toy treatment it deserves with movie-accurate action figures of The Baron, Fang and Dracula! Each 7-inch scale figure includes a display base and movie-accurate accessories, and comes in its own display-ready collector packaging. Sculpted by Tony Cipriano! 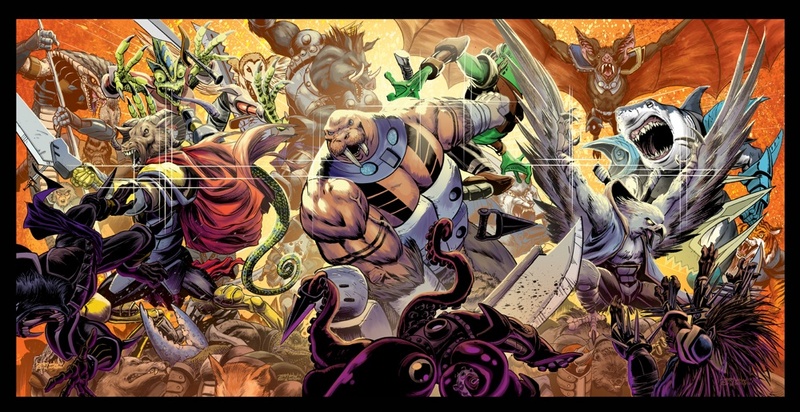 The final chapter of the Battle Beasts mini-series comes to its teeth-gnashing conclusion! The entire Beast invasion force descends on our heroes as they attempt to reclaim the Dread Weapons from the last man on Earth who should wield them — the megalomaniac boss of Bliss Reynolds! Can Vorin, Merk and Gruntos stand against the newly empowered rageaholic? Can any Beast? Can the world? They’re going to try! 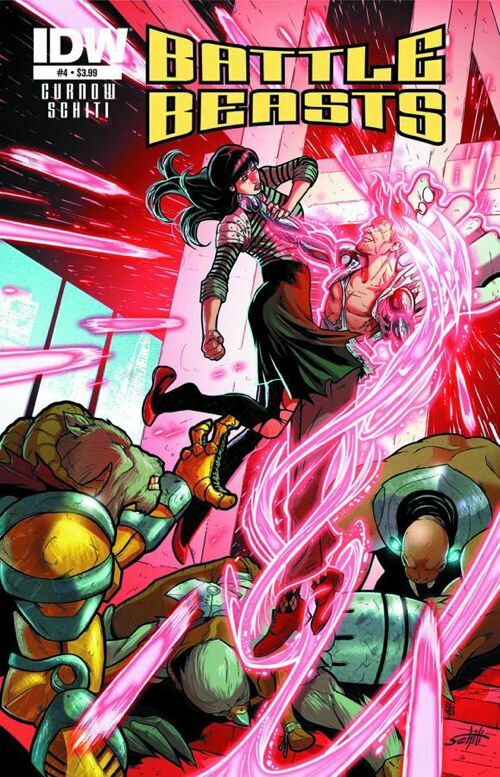 Words by Bobby Curnow, art by Valerio Schiti, variant cover by Jeff Zornow! Toys coming this winter from DST! 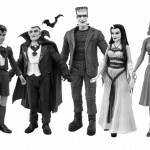 Voted Best New License of 2011 by Cool Toy Review, DST’s hit 7″ Munsters line continues with the next two figures in the family, Eddie and Marilyn! The two youngest members of the Munster clan come as a pair, side-by-side in display-ready Select figure packaging, along with Eddie’s stuffed animal Woof-Woof and an exclusive accessory: Spike’s enormous collar! 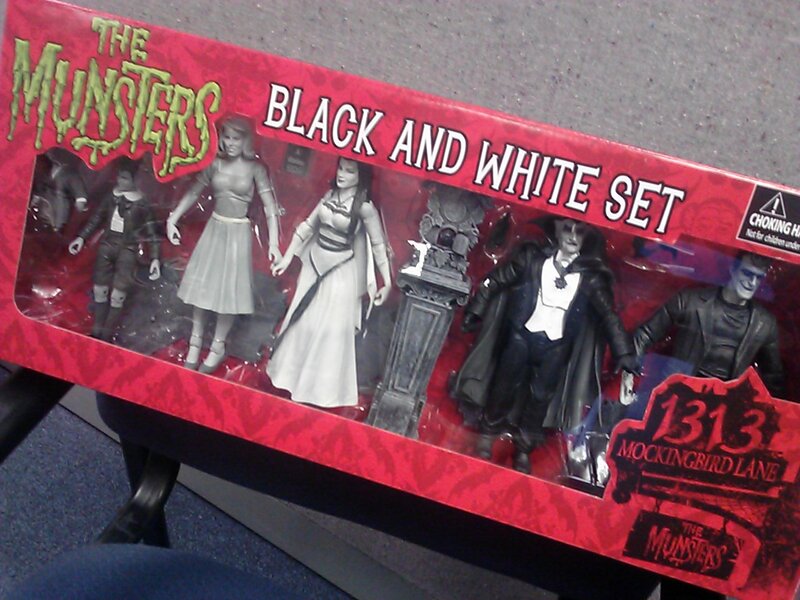 The missing piece in your Munsters collection! Sculpted by Jean St. Jean! You’ve collected them in color, now we’ve collected them in black-and-white! This deluxe collectors’ box set presents the entire Munsters clan — Herman, Lily, Grandpa, Marilyn and Eddie — as they looked in their original black and-white TV appearances on The Munsters! The black-and-white versions of Eddie and Marilyn will only be available as part of this set, and all of them come with bases and accessories in a display-quality window box. Sculpted by Jean St. Jean! 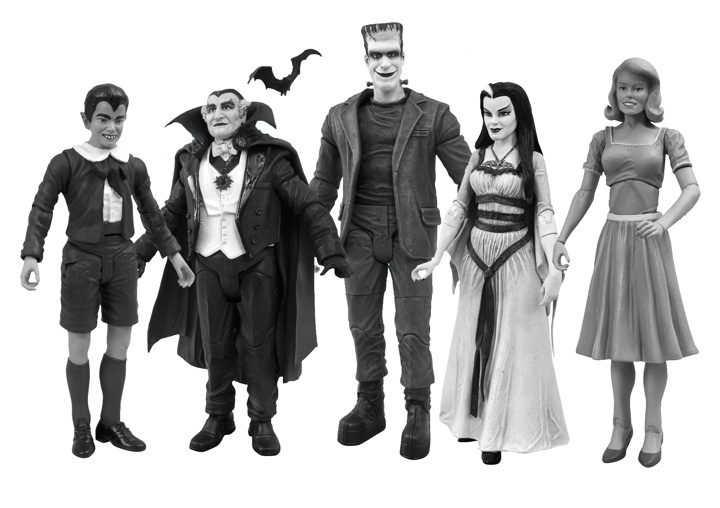 Everybody’s been talking about The Munsters lately, from DST’s popular 7-inch figures to the upcoming TV special. Well, now the Munsters are going Mini! 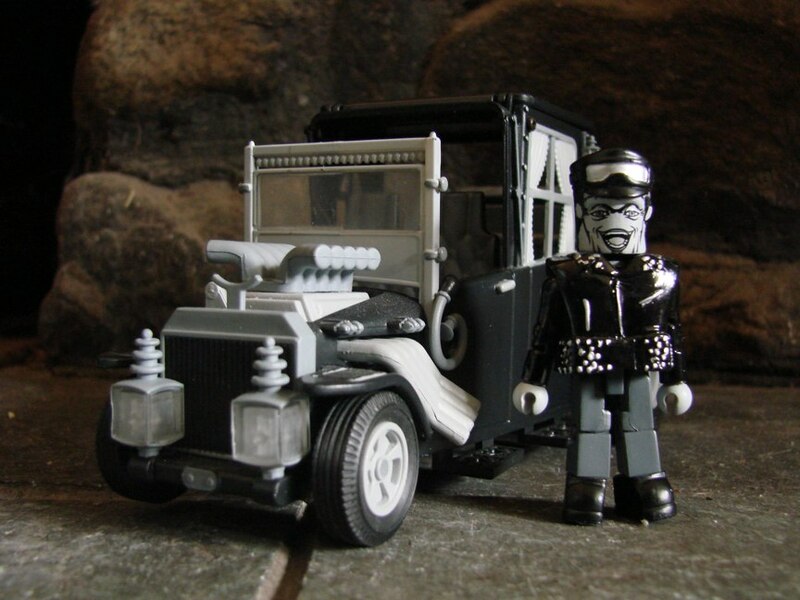 The first-ever Munsters Minimates vehicle is the Munsters Koach! It comes in an exclusive black-and-white color scheme, with an excusive figure of Herman Munster in his racing outfit. The Koach can accommodate multiple 2-inch Minimate figures, and is packed on a blister card. Meet the newest Mini monster! The popular Universal Monsters line of Minimates expands its line-up to the classic film The Hunchback of Notre Dame with this all-new box set! 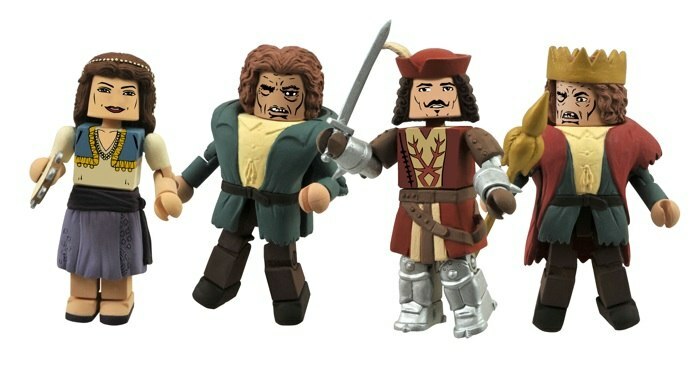 The set includes Quasimodo, Phoebus, the set-exclusive Esmerelda and the set-exclusive King of Fools Quasimodo! Each Minimate stands 2 inches tall with 14 points of articulation and a variety of removable and interchangeable parts and accessories. 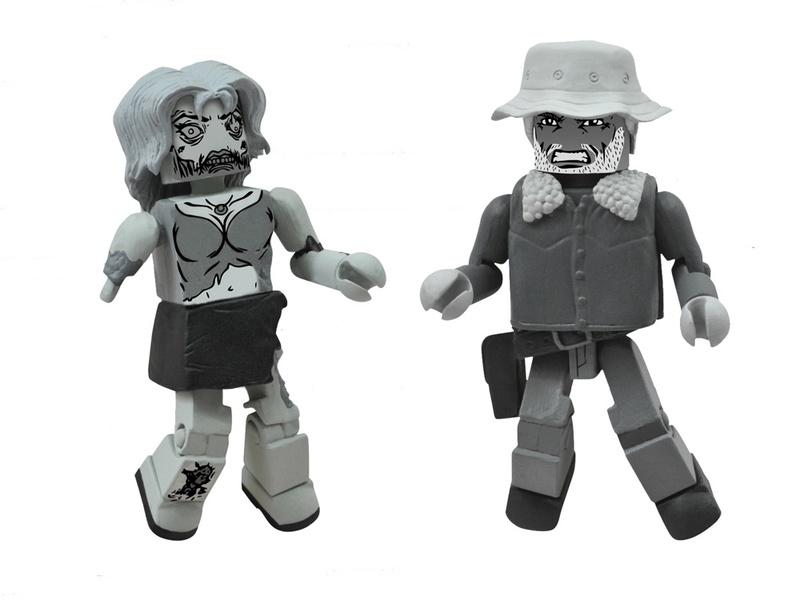 The Walking Dead comic book has reached its landmark 100th issue, and Diamond Select Toys is celebrating with an exclusive black-and-white two-pack of Walking Dead Minimates! Winter Coat Dale and the Female Zombie come colored in shades of grey, in honor of the long-running black-and-white series, and will only be available through retailers participating in Halloween ComicFest. Each Minimate stands 2 inches tall with 14 points of articulation and a variety of removable and interchangeable parts and accessories. You can see some photos by clicking the headline of the story.